After playing all of two games at home over the last month, the Portland Trail Blazers (and those who travel covering the team) get four-straight games at home starting Monday night with the Indiana Pacers. That homestand comes at just about the right time for the road-weary Trail Blazers, especially with the news that CJ McCollum will be out for at least a week, and perhaps longer, with a popliteus strain in his left knee. While homecourt advantage certainly isn't going to make up the 21.3 points, 4.0 rebounds and 2.9 assists McCollum has averaged this season, the Trail Blazers are 29-9 at the Moda Center this season compared to 17-18 on the road, so getting a solid slate of home games certainly helps. And three of those opponents are from the East, a conference the Blazers have dominated this season. When you're shorthanded, you take the help anywhere you can get it. So here's where the Trail Blazers stand in the Weekly Power rankings. If they're able to get through this week relatively unscathed even without McCollum, they probably just back into the Top 5 before heading out for the last extended road trip of the season in roughly a week and a half. Guard CJ McCollum and the Blazers breathed a sigh of relief when he was diagnosed with a popliteus strain in his left knee. With McCollum out for at least a week, Portland will need some scoring from usual reserve guard Rodney Hood. Hood is averaging 11.3 points and 1.6 made 3-pointers per game in March. The five-year NBA veteran scored a season-high 27 points against Charlotte on March 3. The folks at ESPN.com have the Trail Blazers behind the 76ers at No. 6 and ahead of the Celtics at No. 8. The Blazers' starting lineup continues to rank near the top of the league in minutes played (both total and per game) and, since the break, has outscored its opponents by 21.2 points per 100 possessions, the best mark among 14 lineups that have played at least 100 post-break minutes. But their bench has struggled to maintain leads (Enes Kanter has had a positive plus-minus in just one of his 11 games with Portland) and they'll be without C.J. McCollum (left knee strain) for at least a week. Considering the alternative, the McCollum diagnosis was good news, but the injury was a reminder that this team has been relatively fortunate health-wise. In the 25 months since the Blazers acquired Jusuf Nurkic from Denver, McCollum, Nurkic and Damian Lillard have missed just four, 11 and 12 games, respectively. Schuhmann has the Trail Blazers behind the 76ers at No. 6 and ahead of the Spurs at No. 8. The Big Question: Will the Enes Kanter trade come back to bite the Blazers? Because of his poor defense, Kanter has the worst on-off differential on the team. In Kanter's 11 games with the Blazers, they have been outscored by 11.3 points per 100 possessions when he's on the floor, and when he's off the floor, they outscore opponents by 14.6 points per 100 possessions. Since the trade, this team is nearly 25 points per 100 possessions better with Kanter on the bench. 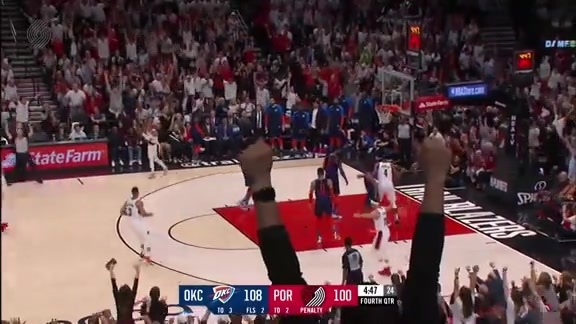 Why not less Kanter and more Zach Collins? While no one is claiming Kanter is a defensive stopper, I would imagine these numbers are a bit noisy considering Enes is one of the few Blazers who plays almost exclusively with the second unit. 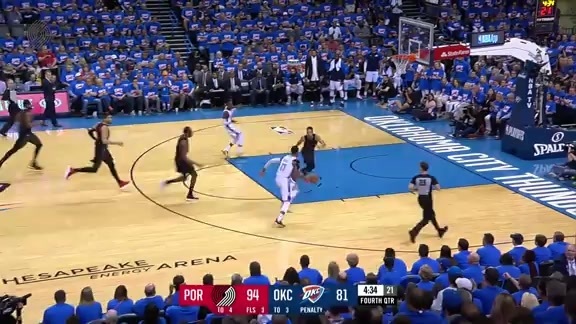 Also worth remembering the bench was having a rough go of it before Kanter arrived, which is the main reason the Blazers signed him in the first place. Also, it doesn't invalidate the critique, but the Blazers didn't trade for Kanter, he was signed as a free agent after being waived. Forgrave has the Trail Blazers behind the Nuggets at No. 6 and ahead of the Celtics at No. 8. Beer has the Trail Blazers behind the Celtics at No. 7 and ahead of the Spurs at No. 9. Rollins has the Trail Blazers behind the 76ers at No. 8 and ahead of the Spurs at No. 10. Portland is currently 1.5 games out of the 3-seed, behind the Houston Rockets. Normally, I’d love their chances of breaking through. Their schedule isn’t that tough the rest of the way, and even their four-game road trip is something they can actually sweep. But losing CJ McCollum, even if it’s just for a week, puts enough of a damper on the rest of their regular season that it will be tough to catch Houston. Just focus on getting McCollum back healthy, and hope you can keep OKC away from taking home court advantage in the first-round. Even still, the Blazers should feel pretty good about where they are. Harper has the Trail Blazers behind the Thunder at No. 7 and ahead of the Pacers at No. 9.